11th Street South and a gravel pit . . .
Eleventh Street South is where I lived for a couple of years that included my first year in elementary school. It was the second house we lived in following our migration from Vernon, Alabama to Columbus, Mississippi. That first house, located on Fifth Street South, has some vivid memories I intend to share with my visitors, memories that are just as fresh as when they were acquired. The house was where I and my youngest sister were administered to by our mother—medicated—when she became convinced that we both had or soon would have scabies—the itch. Click here for that story—it’s worth the visit! I lived on Eleventh Street with my mother and three older sisters in a small frame house, a three-room shot-gun house, so called because it was said that one could fire a shotgun through the front door and the shot would go straight through the house and out the back door. The house boasted electricity and running water but had no bathroom. The necessary, a one-hole privy or outhouse, was located a few yards from the back door. Ours was the next-to-last on the block, and Fuqua’s Grocery was located at the other end of the block, a mercantile that figured prominently in our lives, especially mine—it’s a fit subject for a posting, and deserves individual attention. It’s mentioned in a previous posting, and among other things includes a discussion of my first job and my first firing—click here for that posting. The last house was the residence wherein resided my best friend Tootie—his name was Edward Earl but he was nicknamed Tootie and for good reason—he had a predeliction for producing gas—flatulence—he would have been more aptly named Flatus—that has a nice Roman ring to it—a Latin lilt, so to speak. Tootie figures prominently in this posting and will be featured in a future story concerning a significant Saturday, a day when Tootie and I were privileged to ride in a city police car for a short distance and a day on which in current times would have warranted an Amber Alert. Just as a harbinger of tales to come, Tootie once nailed the door to our privy shut—I’m unsure why, but the act was probably his revenge for something I had said or done. My mother had to borrow a hammer from a neighbor in order to pull the nails and put the family back in business. Just as an aside, back in the 1980s while living in the Washington, D.C. area, I spotted an auto license plate that read FLATUS. I was traveling to my job in downtown D.C. with a friend and his wife. I laughed when I saw the plate and they asked me what was so funny. I told them and they both laughed, but after a short pause the wife said, “What does that mean?” Her husband unashamedly admitted that he didn’t know, so I had to explain. 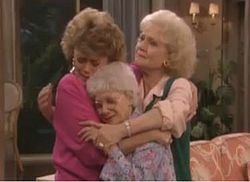 In their defense, I must tell you that they were from Minnesota, born and bred there—that should be adequate explanation for anyone that remembers Rose Nylund on TV’s Golden Girls, portrayed by Betty White as a typical native of Minnesota. The asphalt pavement ended at our house, and the two-lane gravel road continued straight for a short distance and then made a sharp left turn, almost ninety degrees, before continuing on into rural areas, outside city limits. If, instead of turning left, a driver or pedestrian continued straight on a two-rut road for a mile or so, they would come to a large gravel pit filled with water—cool, clear, blue and deep water, a magnet for the boys from a nearby orphanage, the Palmer Home—and for me. Click here for a brief history of the home. Over the years the orphanage has grown and is now known as the Palmer Home for Children. Click here for an update. My mother often threatened to send me to the Palmer Home unless I changed my ways, specifically concerning my frequent trips to the gravel pit. I never told her that I would welcome the transfer because I envied the kids there. They had all sorts of animals—cows and horses and dogs and goats and a farm where they grew vegetables—they were allowed to feed the animals and milk the cows and work in the garden and had what appeared to be unrestricted access to the gravel pit—in fact, the gravel pit was on property owned by the Home. For those unfamiliar with the term, gravel pits are created when material—gravel—for use in road building and construction, is mined in an open pit. Because the water table was high in my area, a grand swimming pool was formed—a pool of cool, clear, blue and deep water, a magnet for the boys that lived at Palmer Orphanage, and of course for me. On a memorable day in a hot summer, memorable for the heat and the cooling effect of gravel pit water, but most memorable for me a day in which my mother came to the gravel pit looking for me and found me. I was blissfully floating around on my back in the middle of the pit, face upturned to the sun and eyes closed, and a clamor arose. I looked around and watched my friends from the orphanage scramble for their clothes and head away from the pit towards the orphanage in considerable haste. And I saw my mother standing on the bank, my short pants in one hand and my leather belt in the other. With the departure of the other boys the area grew silent, a silence broken only by my efforts to stay afloat and offshore as long as I could. After awhile my mother told me I might as well come on in because she wasn’t leaving without me. I stayed out in that cold clear deep water until my lips turned blue and everything I had shriveled up—you know, like fingertips, toes, etc. When I finally came out my mother refused to let me have my shorts, but instead pointed me in the direction of home and ordered me to march. And march I did, driven on by frequent pops on my bare derierre. With each pop I accelerated my pace a bit, but each time my mother told me not to run, that it would be even worse when she caught me. The blows from the narrow belt were not delivered in anger—I would like to believe they were delivered with love, but with repetition they began to take a toll, much as does the fabled Chinese water torture process. She whipped me for the full mile, all the way to our house, along the two-rut road and into the middle of the street, past Tootie’s house where that worthy was standing on the front porch, laughing and pointing at me as I hopped, skipped and jumped along, and finally after an eternity, through the front door of our house. No, that derierre above is not mine—that’s a plastic replica of Donatello’s sculpture of David. The colorful ones on the right are those of naked cyclists, presented here only because the colors are as fascinating as they are functional. I learned a lesson that day, not to stay away from the gravel pit, but to be far more furtive—sneaky, so to speak—in planning my trips to the gravel pit. I couldn’t help it—it was in my nature—as a child I was a vagabond and probably would have been well served with around-the-clock supervision. Had I been a a few years older I would have been riding the rails with the multitude of others during the Great Depression. As a child I was inexorably drawn to water in all its locations, whether pond, lake, creek, river, swimming pool, mud puddle or sewage ditch—yes, sewage ditch—our next home, also located on the south side of town, was adjacent to an open sewage ditch where I spent many blissful hours. Because of water’s attraction I had great difficulty staying at home, a trait—call it a fault if you will, but I consider it a trait—less admirable than others but nevertheless a trait rather than a fault. There will be additional postings in reference to my fascination with water in all its aspects. That’s a threat as well as a promise, so be forewarned and govern yourselves accordingly.